UofL is committed to building smarter and conserving energy and water on campus. In growing and improving our campus facilities, UofL is working to minimize environmental impacts and maximize opportunities for efficiency. Much of this effort is guided by the Office of University Planning, Design and Construction (UPDC). See a summary of UPDC sustainability efforts. 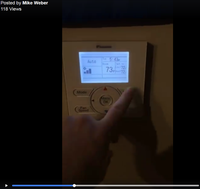 In 2012, UofL installed real-time energy-monitoring and display technology in four residence halls: Unitas Tower, Louisville Hall, Kurz Hall, and Community Park. These online Building Dashboards allow residents to get a handle on their energy usage and to get real-time feedback about conservation efforts within these residence halls. 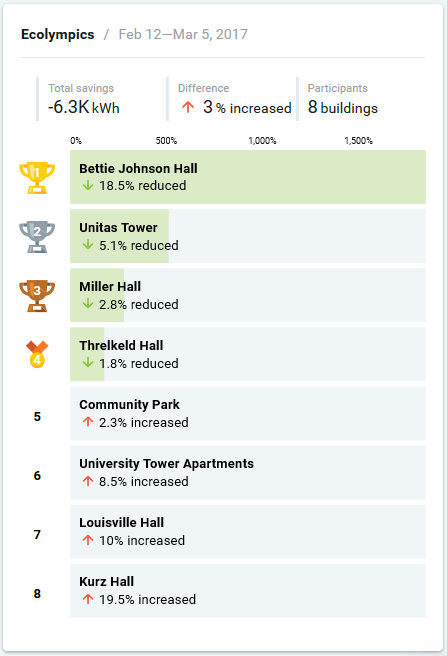 Our Building Dashboards help UofL residents gauge progress during our annual energy conservation competition and helped UofL finish in the top ten energy reducers in the spring 2012 Campus Conservation Nationals! UofL's new LEED Gold Student Recreation Center opened in October 2013, featuring geothermal heating and cooling, solar hot water, rainwater capture & storage for irrigation, and a Siemens building dashboard available in the lobby on an interactive touch-screen that displays the performance of these systems. In 2012, UofL began shutting off lighting in campus vending machines to save energy. New snack vending machines were installed in 2013 with motion-sensor LED lighting. UofL's annual utility bill (electric, gas, water and sewer) is over $19.5 million. In recent years, we've spent nearly $1 million every month of the year on energy ($11.7 million for electricity and gas in 2011). There are tremendous cost savings and environmental benefits to be gained from using energy and water more efficiently on campus. UofL has made massive investments to retrofit its existing facilities in order to increase the efficiency of our operations, reduce costs, consume less energy and water, and produce less pollution as a result. Our $52 million investment in efficiency, through an energy savings performance contract with Siemens, stretched over three phases from 2009-2017. The project involved upgrades to over 88 buildings (6.2 million square feet) on all three UofL campuses. These improvements are projected to directly save the university over $4.4 million every year and reduce our annual carbon dioxide emissions by over 46,000 tons (the equivalent of removing 7,690 cars from the road). With these improvements, UofL expects to reduce its utility bill by about $12,086 per day! These efforts have already produced documented results. In FY 2011-12, for example, we documented that Belknap Campus alone reduced fuel use 48%, electricity use 27%, and water use 31%. Efficiency-minded campus users helped us exceed our engineers' expectations! They had predicted fuel use to decline nearly 40% and electricity use to drop at least 20% annually. Read more. Some examples of efficient lighting and insulation jackets installed at UofL. Low-flow shower head replacements were installed throughout Belknap campus in 2010. Efficient lighting: Installed 117,483 fluorescent lamps, 41,714 ballasts, and 1,729 exterior induction lamps. Reduces lighting energy consumption by 14% for an annual savings of over $915,000. Insulated steam valve jackets: 1,152 installed. Reduces heat loss at the valve by 90%. Saves over $327,000/year. Occupancy sensors for lighting: Installed 2,011 occupancy sensors to automatically shut off lights in vacant rooms. Reduces lighting energy consumption by 20-40%, saving over $97,000/year. Low-flow shower heads: 616 standard shower heads were replaced with efficient 2.0 gallon/minute heads. 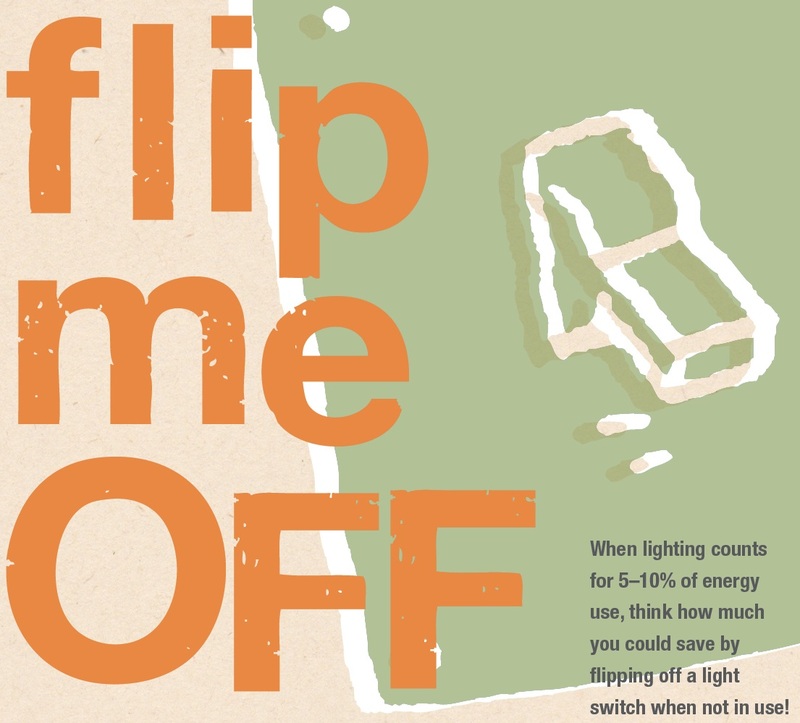 Reduces water use by an average of 11%, saving over $34,000/year. Low-flow faucet aerators: Installed 20,426 pressure independent aerators. Reduces water consumption at sinks by an average of 58% for an annual savings of over $159,000. Efficient motors: Replaced 259 motors with new models that use an average of 5% less energy for an annual savings of over $35,000. Energy efficient belts for motors: Replaced 213 standard V-style belts with non-slipping synchronous belts with variable frequency drives. Cuts energy use by an average of 8% for a savings of over $46,000/year. Learn more about the project and see pictures of the efficient technologies being installed with this presentation. - In October 2009, UofL and Siemens Building Technologies Inc. began work on a $21.7 million, 13½-year performance contract to increase efficiency on Belknap Campus. - In 2010, a second phase performance contract was agreed for the Health Sciences Center, Shelby campus, and a few more Belknap projects, involving another $23.8 million in retrofits. - On Feb. 5th, 2015, UofL trustees authorized spending up to $10 million more for a third phase of the contract. In June 2015, implementation work began on $5.4 million in improvements in lighting, heating, electrical systems, water conservation and other areas, expected to lead to another $457,600 in annual cost savings. Cardinal Sports Park, Ekstrom Library, J.B. Speed, Strickler, Shumaker, and Sackett halls on Belknap Campus were among the buildings that received improvements, along with the Research Tower and Baxter I, Baxter II and Medical-Dental research buildings at the Health Sciences Center. Learn more about the project's cost savings, environmental benefits, and scheduling at our Energy Savings Performance Contract website. In summer 2017, Campus Housing upgraded to new Energy Star washing machines and dryers that consume 40% less water and 25% less electricity than the original machines which are located in all UofL residence halls. In spring 2017, UofL began a pilot test of eTemp energy-saving devices on four of our commercial refrigeration units. In May 2017, UofL replaced lighting with high-efficiency, cooler, brighter LEDs in portions of the Baptist Campus Center, the lobby of the Playhouse, and in the dining area of the Ville Grill, where 240 42W bulbs were replaced with 26W LEDs. At the Ville Grill alone, this cut lighting energy use 38% for a savings of $1268/year (2.8 year payback) before even accounting for reduced load on HVAC. In 2018, UofL will use a matching federal pedestrian transportation improvement grant to improve the quality and efficiency of outdoor lighting with LEDs installed along additional Belknap campus pathways, including the Humanities canopy lighting. Study shows campus energy project has paid off for region (UofL Today, June 2, 2015). Watch video here. View photos here. Download the full Economic Impact Report here. All new construction and major renovation projects at UofL are designed and built in accordance with Kentucky's High Performance Building Standards, using the Leadership in Energy and Environmental Design (LEED) Green Building Rating System™ as a guide or for certification, depending on the scale of the project. LEED standards not only encourage efficiency, but a wide range of practices which reduce the total environmental impact of buildings during construction and occupancy. UofL now has LEED Gold certified buildings on all three of our campuses! One of our goals in UofL's Climate Action Plan is to source 20% of the university's energy needs from renewable sources by 2020. As we transition toward climate neutrality by 2050, UofL has made a bold commitment to renewable energy. Our immediate goal is to source at least 20% of our power from renewable energy sources by 2020. UofL is seriously exploring options including solar, biomass, geothermal, and low-impact hydropower projects. Some of these efforts are tied to educational and research objectives at UofL. More details are available in UofL's Climate Action Plan. At the moment, UofL, like most utility customers in Kentucky, still relies largely on fossil fuel-generated power purchased from the grid. We do not currently generate a significant percentage of our electricity on campus, but we are moving in that direction with a commitment to renewable energy that has already manifest itself in a number of pilot projects. In solar energy alone, UofL has installed on campus a total (as of August 2018) of: 589 photovoltaic panels (143.4 kW) and 35 solar thermal collectors (120.16 square meters). 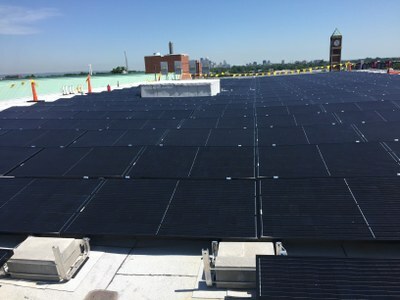 The 170,000 sq ft Belknap Academic Building opened in 2018 with a photovoltaic solar system on the penthouse roof which supplies 5.1% of the total energy needs of the building. With 321 panels, it is an 89 kW system with an estimated annual production of 115,709 kWh. In spring 2014, UofL installed a 16-panel, 165 MMBtu solar pool heating system on the roof of the Ralph Wright Natatorium to tackle the high energy demands of regulating the temperature of the largest body of water on campus - our Olympic-size pool! UofL's LEED Gold Student Recreation Center opened in October 2013, featuring not only a 134 MMBtu solar hot water system, but 128,000 square feet of space heated and cooled by the University's first geothermal system. The geothermal heat pipe is a closed-loop vertical well system with a total of 180 wells 400 feet deep. This 4960 MMBtu system provides ample reserve capacity and is expected to generate about 22% annual energy cost savings compared to a conventional system. It is also considerably simpler and cheaper to maintain. Occupational use of the new facility has tripled when compared to the previous Recreational Center, yet energy costs were reduced to provide UofL with almost $100,000 of savings per year. See case study. Read more. - Solar-powered house gets new life at Speed School (UofL News, May 16, 2016) Video. - Students welcome hundreds to see inside solar house. Photos. In October 2013, UofL students took part in the U.S. Department of Energy's Solar Decathlon competition, finishing first in the Affordability and Power categories! Read more about the experience.See the full results here. UofL students, faculty and staff collaborated with others from Ball State University and the University of Kentucky as Team Kentuckiana to design and build a fully solar-powered, modular home called "The Phoenix House." The project was designed to aid in disaster recovery and provide a model of green living! - In Spring 2016, the Phoenix House was reinstalled at UofL (at the southeast corner of Ernst Hall) for further research and educational purposes, and to act as administrative offices for UofL's Conn Center for Renewable Energy Research. This energy-efficient, solar-powered (6 kW array of 27 PV panels on the roof with lithium ion battery storage) building is using the campus as a living lab for sustainability, testing smart net metering and energy storage technologies. In addition to modeling the future of energy, it features native plants grown in UofL's own compost made from food waste and irrigated by giant rain barrels, as well as a courtyard sculpture garden with hand-carved wooden benches where you can charge your mobile devices at a solar charging station. Students are also building electric-assist bicycles that will be charged by the sun in a rack outside the building. - For more information, contact the team's faculty mentor, Dr. Mark McGinley (502-852-4068). The roof of UofL's LEED Gold certified Center for Predictive Medicine on the Shelby campus houses a 50.4 kilowatt solar photovoltaic array with 252 panels. At the time it was installed in 2010, it was one of the largest rooftop solar arrays in Kentucky (see photo above). In May 2012, students in UofL's Renewable Energy & Energy Efficiency Club, designed, constructed and installed low-cost 120-watt solar panels at the Garden Commons to power the ventilation system for the new greenhouse. Read more about the project. The computer controlled dual-axis tracking solar array on Sackett Hall at the J.B. Speed School of Engineering produces both electricity (2 kW) and hot water for the building. It is the only such tracking array in Kentucky, and is intended for research, development and education, while supplying a portion of the building's electricity and hot water. Because it is able to track the sun precisely throughout the day and across the seasons, it is 30% more efficient than fixed solar panels. The two solar thermal collectors in the center of the array provide nearly 100% of the building's hot water in the summer, and ten photovoltaic panels feed enough electricity into the grid to power the building's computer laboratory. 1. Robinson BS & Sharp MK, “Reducing unwanted gains during the cooling season for a solar heat pipe system,” Solar Energy 115:16-32, 2015. 2. Robinson BS & Sharp MK, “Heating season performance improvements for a solar heat pipe system,” Solar Energy 110:39-49, 2014. 3. Robinson BS, Chmielewski NE, Knox Kelecy A, Brehob EG, Sharp MK, “Heating season performance of a full-scale heat pipe assisted solar wall,” Solar Energy 87:76–83, 2013. 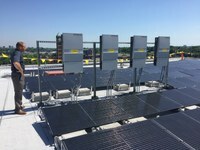 On the roof of Burhans Hall on Shelby Campus, UofL installed a solar water heating system in 2009 with support from the Kentucky Institute for the Environment and Sustainable Development (KIESD). The system uses the heat of the sun year-round to warm a 120 gallon water tank and can generate up to 30,000 BTUs of heat. These two panels have reduced natural gas usage for water heating at Burhans Hall by as much as 50%. As early as 2009, Chemical Engineering faculty and students got involved in the conversion of waste vegetable oil from UofL Dining services into biodiesel used to fuel our campus shuttle. We began to scale-up this effort in 2011-13, when UofL Dining began supplying some used cooking oil for local conversion into biodiesel. The project began through a partnership with the Louisville Biodiesel Cooperative and then Kelley Green Biofuel of Goshen, KY (5100 Greenhaven Lane), a community-scale, ASTM-certified, National Biodiesel Board registered biodiesel producer with an annual capacity of 75,000 gallons, located just 30 miles from campus. In May 2014, UofL's Grounds crew began a new trial using this locally-produced biodiesel to power their diesel machinery and trucks in a B20 blend. They experienced no issues and were willing to continue using biodiesel. In 2017, 2,410 gallons was collected for local biodiesel (through Vocars, located just blocks from campus on Commerce Road) and 1,019 gallons went into national yellow grease commodity markets (through DAR PRO). In 2009, UofL commissioned consultants from Cannon Design to produce a report on the practical and economic feasibility of renewable energy options for UofL, including solar, wind, geothermal, hydropower, biomass, and landfill gas. Download a copy of the report here. In 2013, UofL launched a new Space Heater Policy, designed to discourage the use of inefficient personal space heaters in rooms on campus where central heating and air conditioning can be adjusted to fix the problem. Space heaters are expensive energy hogs and can pose serious fire and electrical hazards. UofL strongly discourages their use in offices and bans their use in residence halls, Greek housing, or any sleeping quareters. Occupied Hours 66-72 Degrees F.
Unoccupied Hours 55-65 Degrees F.
Occupied Hours 74-78 Degrees F.
Unoccupied Hours 78-85 Degrees F.
If your room is cold, please contact Work Control to request a room temperature audit and adjustment. Either fill out a request online here, or call 852-6241 (Belknap); 852-5695 (HSC); or 852-5601 (Shelby). Temporary use of an approved space heater may be allowed only if sub-66 F temperatures persist following a Physical Plant audit and adjustment. Preferred heaters use radiant heat (rather than resistant heaters whose coils may exceed 1000 degrees F), and are thermostatically-controlled. Radiant heaters are more energy efficient because they are designed to radiate direct heat to the users’ body. If using university funds to purchase a space heater, University policy requires that such purchase is made through the UofL Stockroom. The purchase of space heaters through retail establishments using University funds is not authorized nor will those charges be approved for reimbursement. Using a University credit card for the purchase of space heaters is also in violation of University policy since these items are available through the UofL Stockroom (333 E. Brandeis Street, 852-6253). After November 1, 2013 space heaters not approved by the University Fire Marshal must be removed. Read the full UofL Space Heater Policy here. Vegetated roofs are not only beautiful, but they help moderate temperatures to reduce the urban heat island effect and building energy demands for cooling and heating, while reducing storm water runoff, generating oxygen, and providing wildlife habitat in the urban landscape. They can also be designed as green spaces for urban dwellers looking to escape the concrete jungle. The University of Louisville has begun installing green roofs to help demonstrate their many benefits, with projects at The Nucleus building at Market & Floyd Streets, the College of Business expansion, the Early Learning Center at Family Scholar House, and the Cardinal Towne affiliated student housing and retail facility. UofL's first green roof tops College of Business addition. Additional photos. In July, 2012, UofL officials gathered for a ceremonial planting of the new green roof sprouting on the first building at the new Nucleus Innovation Park-Market Street, a subsidiary of the UofL Foundation. The eight-story, 197,000-square-foot, LEED Silver building opened in May 2013 with a 6,000 sf fully reflective roof. Bernheim Forest nursery specialists were involved in advising building contractors how to design and maintain the roof, which features Kentucky native plants. In June 2012, UofL dedicated a new wing at Harry Frazier Hall, the College of Business building. The wing houses the equine and entrepreneurship programs. The roof of the building is a vegetated green roof called the M. Krista Loyd Sky Garden, named for the daughter of Raymond and Eleanor Lloyd of Louisville. The garden will reduce storm water surges and is expected to trim heating and cooling costs by 25% in the two-story addition it covers. - 97% of all occupied spaces have natural day lighting; 94% have a direct line of sight to the outside. - Radiant heat panels along the window wall keep the rooms evenly heated. - Low-E glass reduces heat buildup in the summer and reflects heat back in the winter. - Low VOC-emitting paint, sealant, adhesives and flooring reduce indoor air contaminants. 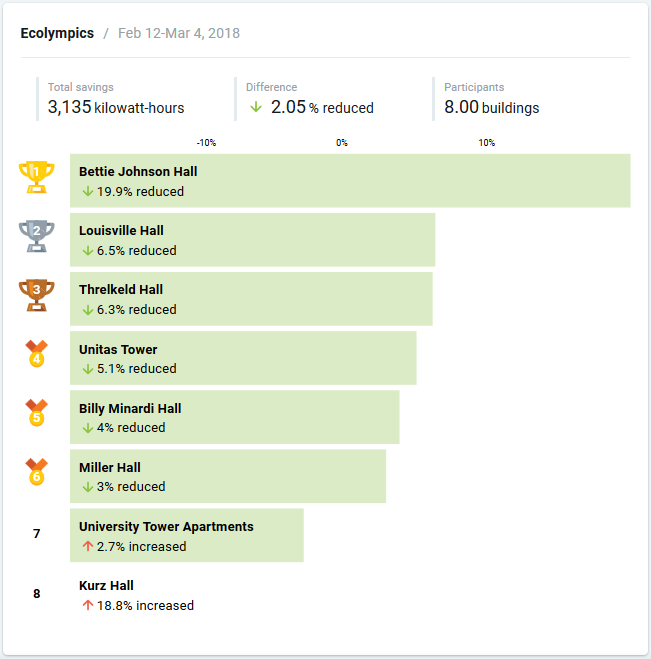 Every spring since 2012, University of Louisville residents have participated in a friendly sustainability competition now dubbed the Ecolympics. In addition to taking steps to reduce waste university-wide as part of the national RecycleMania tournament, students in UofL's residence halls compete to see who can reduce electricity usage the most over three weeks during the Campus Conservation Nationals . Through simple steps like unplugging devices, shutting off lights, air-drying laundry, and taking the stairs, on-campus students are encouraged to save energy and to reduce their carbon footprints. Live on campus? Win with conservation! UofL residence halls compete amongst each other and battle together against campuses across the country to see who can reduce electricity use the most over three weeks. All you have to do is stop wasting energy! Turn off lights/TVs/computers; unplug anything you're not actively using; skip the elevator for the stairs; close windows tightly; dry clothes on a rack/line; take quick showers or shower with solar power at the SRC; etc. The UofL residence hall which cuts electricity use the most will win a specially catered dinner and a Green Renovation project for the hall! 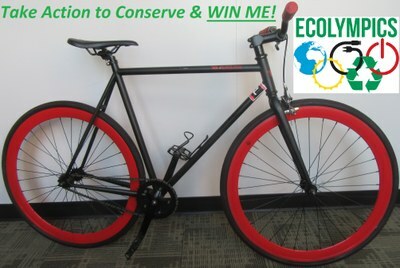 Get in the running to win a bicycle (or $400 bike shop voucher) for Ecolympics! Post photos of yourself taking green actions on social media using the hashtag #ULecolympics20xx and tag @uoflsustainable. The person posting the most green actions will win! Any sustainable action counts: recycling, composting, donating reusable items, riding a bike or bus, carpooling, buying local, taking the stairs, unplugging, turning off lights, TVs & devices, air-drying laundry & choosing the cold setting, taking shorter showers, etc. The amount of carbon that 2.7 acres of forest in the U.S. pull out of the atmosphere each year. Ecolympics 2018 Winner Mike Weber turns it off! Congratulations to Bettie Johnson Hall for winning the Gold Medal in Ecolympics for the third year in a row!! Congratulations to Mike Weber @its_miiikey, who won the Cardinal colored Echo by PureFix Cycles with fifteen #ULEcolympics2018 social media posts showing all the ways he is going green! See some of his video posts here. Congratulations to Bettie Johnson Hall for being the winning on-campus hall for two years running! The results of the Ecolympics 2016 - Cards Cutting Carbon - Feb. 15 to March 6, 2016 competition exceeded all expectations! For the first year ever, all nine participating housing facilities managed to reduce their electricity usage at least somewhat! The two winning halls were The Clubhouse and Bettie Johnson Hall, with reductions of 50.3% and 27.5%, respectively. Over the three weeks, residents helped save 151,882 kWh which equates to keeping 314,696 pounds of carbon dioxide out of the atmosphere, and saving $13,487 in utility bills! - Solar-powered mobile device charging as fast as a wall outlet, day or night. - Three weather-proofed USB ports charge up to three mobile devices simultaneously. 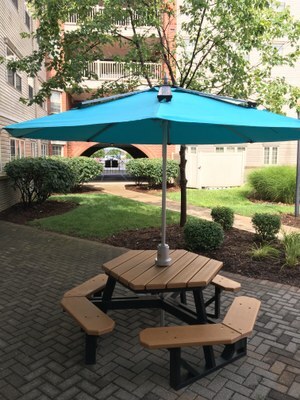 - Commercial-grade patio umbrella protects users from harmful UV rays. - Intelligent sensing acknowledges when mobile device is fully charged. - LED display indicates how much solar energy is currently stored for charging needs. Our Grand Prize winner for being most active resident in Ecolympics 2016, Alexander Levesque of Miller Hall, won a $400 shopping spree at a local bike shop! Congratulations, Alexander! UofL residents battled it out to reduce energy use during the 2015 Campus Conservation Nationals February 9th to March 1st. Each year since 2012, UofL has competed nationally (and locally in the Bluegrass Unplugged competition against UK, WKU, and Berea) to reduce electricity use in residence halls during the Campus Conservation Nationals.CCN is the largest nationwide electricity and water reduction competition on over 100 college and university campuses, covering thousands of buildings and hundreds of thousands of students!Congratulations to our winners! Threlkeld Hall finished first with an overall 2.3% reduction in electricity use, followed by UTA with a 1.1% reduction. As grand champions, the residents of Threlkeld received a special in-house dinner catered by Mark's Feed Store on April 16th. During the meal, residents brainstormed possible projects to be part of their Green Renovation award. Thanks to the resident's energy-conscious actions, over the summer of 2015, the Threlkeld lobby got a brand new water bottle filling station and bikeshare system. Our top 2015 Conservation Superheroes were: Benjamin Leamon (UTA), Gerald Leslie (Kurz), Abby Chen (Louisville Hall), John Hinely (Threlkeld), Hanna Sullivan & Alyssa Farley (Bettie Johnson), and Connor Priest (Miller). All were invited to a special Dinner with President Ramsey on April 6, 2015. The highest individual performer throughout the competition was Benjamin Leamon (UTA), who racked up an impressive total of 317 points for a wide variety of sustainability actions recorded on myActions.org. For his efforts, Benjamin won a brand new commuter bike! The top 2 RAs through myActions.org were Abby Chen from Louisville Hall and Connor Priest from Miller Hall. The competition has ended, but the need to stop wasting energy hasn’t! UofL encourages residents to keep up the conservation momentum: turn off lights/TVs/computers; take the stairs; unplug things; dry clothes on a rack; shower with solar power at the SRC; etc. Log your actions for sustainability at myActions.org. In 2014, UofL residents were able to reduce energy consumption by 2.9% overall! Residents saved 8003 kWh of electricity, worth about $400. This equates to keeping 5.5 metric tons (12,161 pounds) of carbon dioxide pollution out of the atmosphere. That's equivalent to annual emissions from: driving 13,134 miles, switching 144 incandescent bulbs to CFLs, or half of the average home’s energy use! The flooring in the lobby was changed from carpet to a luxury vinyl tile. Not only is the tile better looking, but it is also a longer-wearing product that requires only water to clean – no chemicals or other harsh products. All of the old, inefficient washing machines were with newer, more efficient models. Leaky showerheads were replaced throughout the building. Although the existing showerheads were low-flow fixtures, they frequently leaked and were replaced with a more durable low-flow fixture. The worn furniture in the common area was replaced with a product that uses a sustainable fabric and is designed to be modular so that, if a part of a chair is broken, we can replace just that part easily rather than having to dispose of the entire chair. Individual 2014 Conservation Heroes were also entered in two prize raffles after pledging to conserve or by posting photos of their green efforts on Facebook. One resident earned a $400 bike shopping spree and five others earned a Dinner with Provost Willihnganz. During the competition, tables were set up in the lobby of one of the halls where residents could pledge to take action and pick up free UofL Sustainability reusable shoulder bags, t-shirts, mugs, and water bottles! Residents were encouraged to make a personal commitment to reduce and keep track of their hall's progress with UofL's Building Dashboard online portal! In addition to UofL, CCN 2014 involved 109 schools, 1330 buildings, and over 265,000 students & staff across North America. Together, we saved 2.2 million kWh! That's the equivalent of removing 201 homes from the grid for a year and keeping 3 million pounds of carbon dioxide pollution out of the atmosphere! In 2013, UofL joined 120 colleges & universities across North America in engaging over 300,000 student residents to help save 2,114,844 kWh of electricity! That's equivalent to keeping 2,426,060 pounds of carbon pollution out of the air; saving $178,716; and taking 187 US homes off the grid for a year. 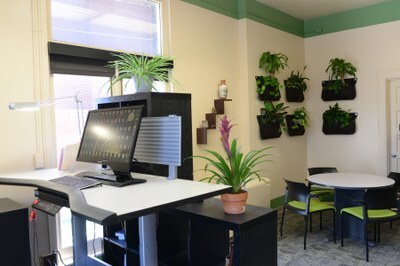 Read the story from UofL Green Scene: Students Compete to Reduce. In 2012, UofL was one of 100 colleges & universities which engaged over 200,000 residents to save 1.7 gigawatt-hours of electricity! This equates to taking 151 U.S. homes off the grid for a year, $158,000 in savings, and 2.6 million pounds of carbon dioxide emissions averted! From March 26 - April 15, 2012 UofL residents were able to reduce energy consumption 11.9%, saving 38,415 kWh of electricity! This equates to $2,689 in savings, and 78,789 pounds of carbon dioxide averted! As one of the top ten energy reducers in 2012, UofL earned 200 megawatt-hours of renewable energy credits (RECs) from Sterling Planet! Read the story from UofL Green Scene: Wrapping your mind around reducing campus energy use. Have revolving loan funds to reinvest energy savings back into the school"